En español | If a little is good, then a lot is … worse? That is the less-is-more conclusion of a new study of older Swedish women that found that eating high-quality chocolate once or twice a week is good for the heart, but eating it too much is not. The study is highly relevant as nearly 6 million Americans have heart failure and one in four women will die from heart disease, according to the National Institutes of Health. Lower blood pressure by dilating blood vessels. Reduce the risk of diabetes by reducing blood sugar and insulin. Activate enzymes that eliminate cancer−causing carcinogens and mutagens. Reduce the risk of blood clots and strokes by inhibiting the clumping of blood platelets. Keep cholesterol levels stable or even slightly improve them. Enhance cognitive function by increasing blood flow in the brain. The nine-year study of women ages 48 to 83 found that those who ate a small amount of Swedish chocolate once or twice a week had a one-third lower risk of developing heart failure. Those who ate it daily received no protective benefit. Women who ate chocolate a couple of times a month also showed some benefit, but not as much as the weekly group. Also significant was the quality of chocolate the women consumed, which had a higher amount of cocoa solids than the average American chocolate. Swedish milk chocolate contains 30 percent cocoa solids, while dark chocolate contains 35 percent. 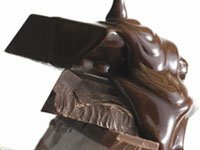 By comparison, U.S. standards for dark chocolate require only 15 percent cocoa solids—half that of Swedish milk chocolate. That doesn't mean American women need to eat twice as much dark chocolate to protect their hearts, cautions Linda Van Horn, professor of preventive medicine at Northwestern University's Feinberg School of Medicine. "Chocolate is not magical and does not work in isolation," she says. A diet that is high in fiber, fruits and vegetables, fish "and a little chocolate," she adds, is best for avoiding weight gain and preventing heart disease. The study, published online this month in the journal Circulation: Heart Failure, was conducted by researchers from Harvard University and Sweden's Institute of Environmental Medicine. They looked at the heart failure rates of nearly 32,000 women who had filled out food consumption questionnaires as part of a Swedish mammography study. The study found that women who ate a small portion — about two-thirds of an ounce to an ounce — of high-quality chocolate once or twice a week had a 32 percent lower risk of developing heart failure. Those who had one to three servings a month had a 26 percent lower risk. Those who ate one serving or more daily didn't appear to gain any protective benefit. Why the bad news about eating chocolate daily? Lead researcher Murray Mittleman, M.D., of Harvard Medical School, thinks it could be because the extra calories lead to weight gain or a less nutritious diet, canceling out chocolate's benefits. However, the study noted that including small amounts of dark chocolate in the diet could help lower blood pressure and that some studies indicate the flavonoids in chocolate help improve heart blood vessel function. Seems the archetypical Swedish proverb lagom är bäst, or “the right amount is best,” holds true for chocolate as well. Candy Sagon writes about health and food for the AARP Bulletin. Cocoa beans are processed into cocoa solids and cocoa butter. The solids contain the antioxidants. The higher the percentage of cocoa content listed on a wrapper, the more antioxidants inside. The purest commercial varieties, like unsweetened baking chocolate, taste bitter, which means that most chocolate consumed contains sugar. Most ingredients added to chocolate raise its caloric and fat content and lower its antioxidants. Milk chocolate also contains milk powder or condensed milk, which may interfere with the absorption of antioxidants. “White chocolate” contains cocoa butter, sugar and milk but no cocoa solids — in other words, zero antioxidants.